Tressa invited me to do my first riding seminar in California……. 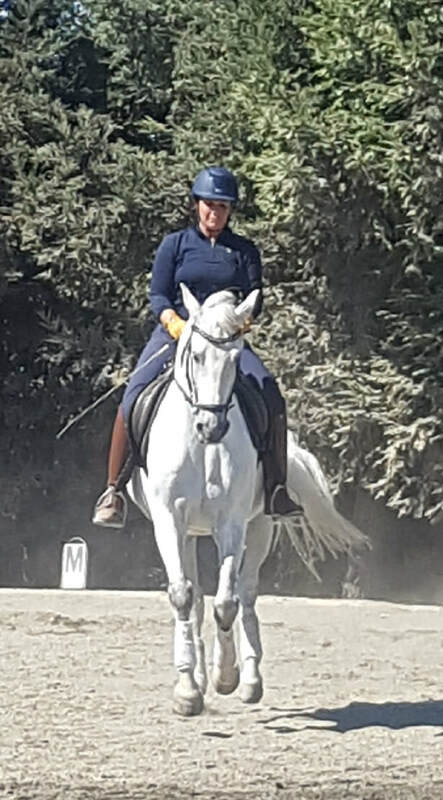 Tressa Boulden is practicing flying change at every 4th stride – very straight, precise and correct. Christoph Ackermann is a keeper of the grail of the principles of Classical riding and horsemanship. His teaching brings us to the finer points of riding, and reminds how to best work with our equine counterpart in a more refined manner. He gets 5 stars! Christoph is patient and brings a touch of humour to his students to bring them at ease.. We thoroughly enjoyed bringing him here to California, and plan to on a regular basis. Lia Scott visited this seminar as spectatur and listener.